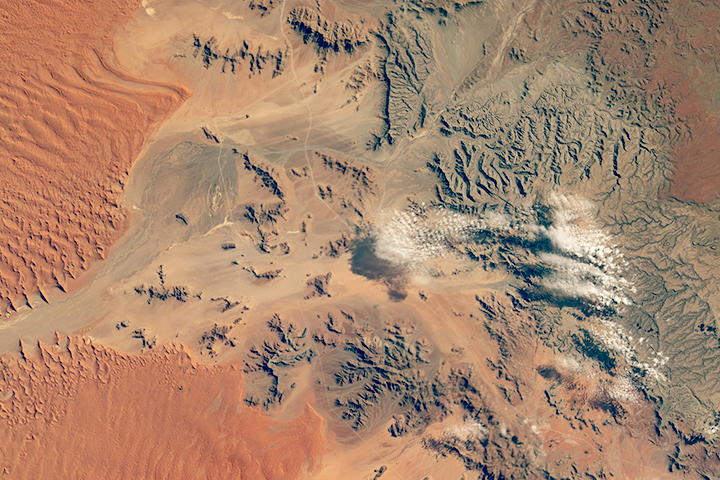 The Namib Sand Sea stands at the heart of Namib-Naukluft National Park, which is located on the coast of Namibia. Most of the terrain is dominated by sand, but one percent features inselbergs, or isolated raised hills. 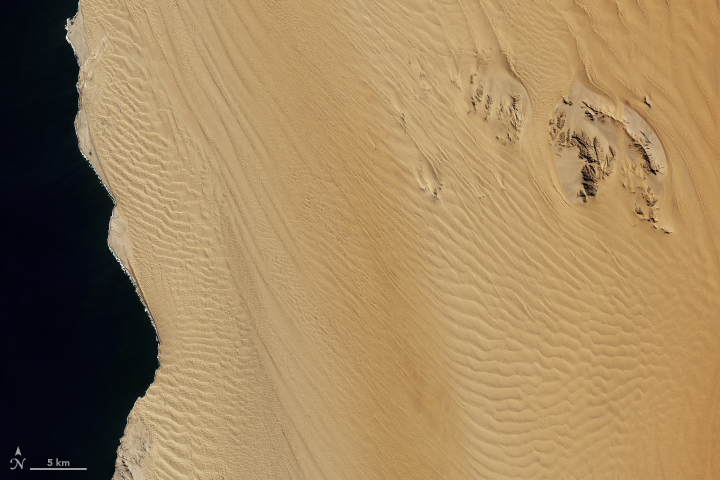 The image above shows two inselbergs in the sand sea: Uri-Hauchab and Hauchab. 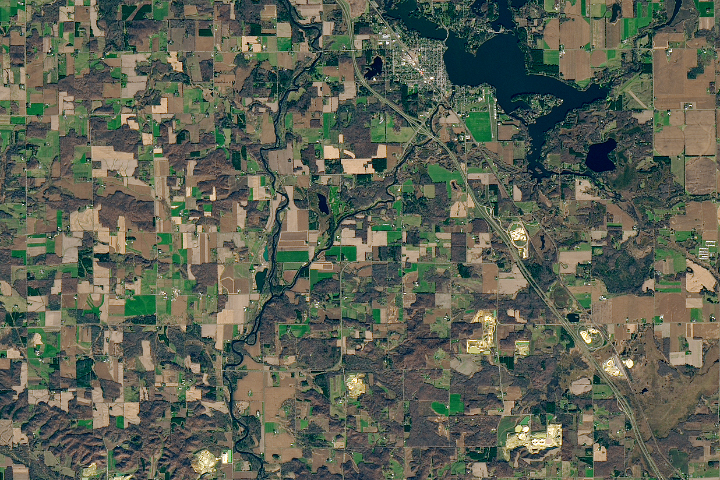 The Operational Land Imager (OLI) on Landsat 8 acquired the image on July 5, 2018. According to a UNESCO World Heritage Center report, the inselbergs receive more rainfall than the surrounding lower-elevation dunes. That is because warm air gets pushed up the mountains from winds blowing past, causing water vapor to condense into clouds. 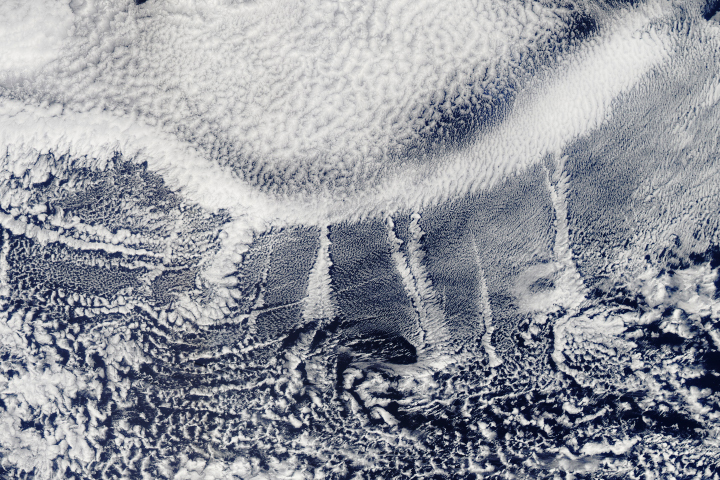 Also, the raised land catches more fog coming from the ocean. Fog is the primary source of water for the Namib Sand Sea, which is the only coastal desert in the world to contain large dune fields influenced by fog. The wetter microclimate results in more abundant and diverse vegetation on inselbergs than sand dunes. Hauchab primarily has vegetation found in the palaeotropical Nama Karoo biome, which fosters shrubs and grasses, and the temperate Succulent Karoo biome, which is famous for its spring flowers. 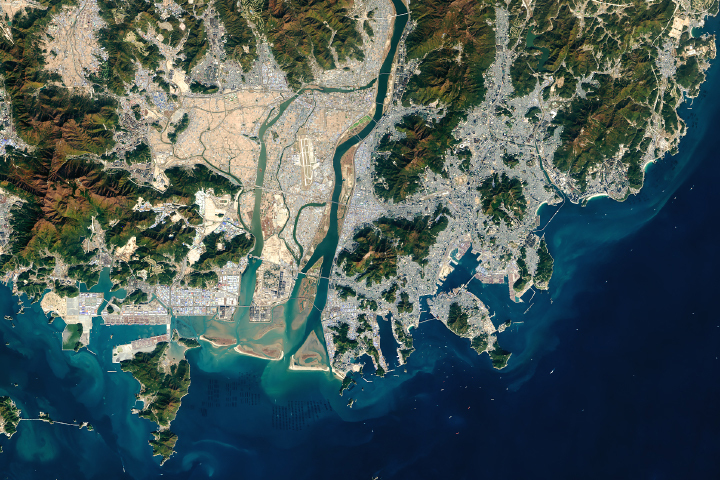 The image above was acquired by the Moderate Resolution Imaging Spectroradiometer instrument (MODIS) on NASA’s Terra satellite on August 10, 2018. 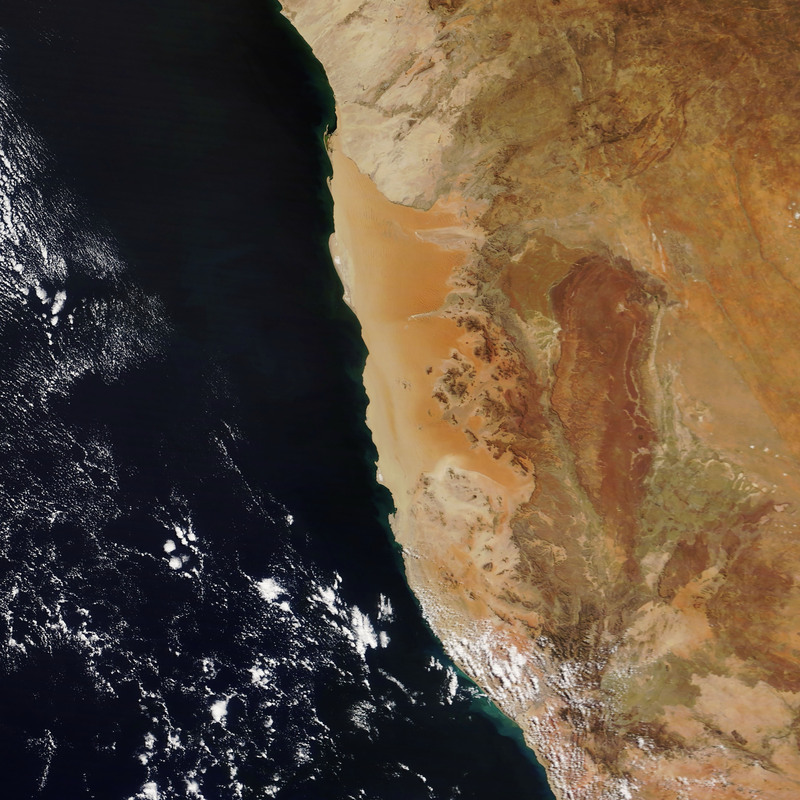 The sand sea covers over three million acres inside the Namib-Naukluft Park. The national park is the combination of the Namib Desert, thought to be the world’s oldest desert, and the Naukluft Mountains, which serve as a sanctuary for endemic Hartmann zebras. 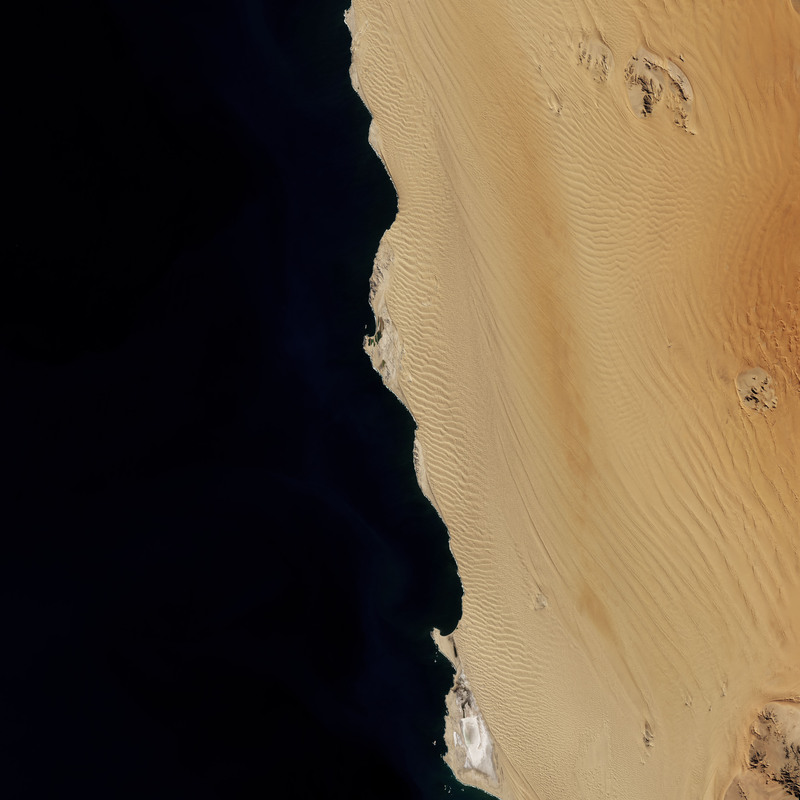 The sand sea consists of two dune seas, one on top of the other. The foundation is an ancient sand sea that has existed for about 21 million years. That has been covered over with younger sand that has been active for the past 5 million years. Sand seas in other parts of the world are generally formed through erosion of hard bedrock underneath, but the Namib Sand Sea is unique because the materials were transported from thousands of kilometers away. Carried by river, ocean current, and wind, sediments were transported along the Orange River to the coast, where they were lifted by winds and deposited inland. NASA Earth Observatory images by Joshua Stevens, using Landsat data from the U.S. Geological Survey and MODIS data from LANCE/EOSDIS Rapid Response. Story by Kasha Patel. Scattered in a sea of sand, inselbergs in Namibia host ecology uniquely influenced by fog. World Heritage Convention Namib Sand Sea. Accessed August 23, 2018. World Heritage Convention (2012) Namib Sand Sea World Heritage Nomination. Accessed August 23, 2018. 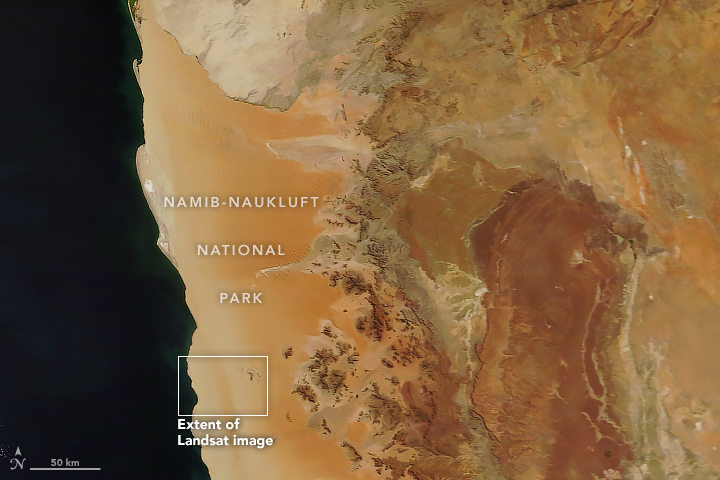 NASA Visible Earth (2009, August 4) Namib-Naukluft National Park. Accessed August 23, 2018. Namibia Ministry of of Environment & Tourism Namib-Naukluft Park. Accessed August 23, 2018. Mapcarta Hauchab. Accessed August 23, 2018.